How Much does Telegraph Dating Cost? With more than 90,000 members, Telegraph Dating is the place to meet singletons aged 40+. Unlike many dating sites which can zap hours of your time as you fill out irrelevant profile details such as how many individual eyelashes you have, Telegraph Dating keeps it simple and effective with short personality and appearance questionnaires which focus on the main points, such as hobbies and interests, to help you find your ideal match. The Telegraph dating site is perfect for singletons concerned about preserving their anonymity and safety online, too. When you create an account, other members will only be able to see your username – not your real name – and although all messages from members will be sent directly to your email account, they will never have access to your email address, unless you specifically send it to them. 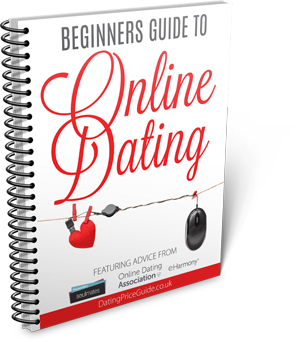 Below you’ll find everything you need to know about the site including the most up to date Telegraph Dating prices, what you get for free and a step by step of the sign-up process to help you breeze through it. 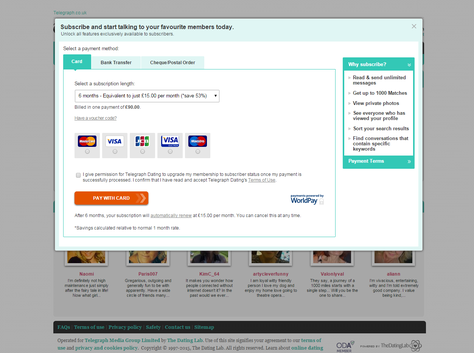 I’ve also added any Telegraph dating discounts currently floating around on the web so you can get the best price. How Much Does it Cost to Join Telegraph Dating? *Note Telegraph Dating requires you to pay all fees upfront in a one off payment. TOP TIP: Like all dating sites. Telegraph Dating will automatically renew your subscription at the price you originally paid when your subscription time is up. You never know if there will be a better deal available when you’re ready to renew your membership, so it’s always worth cancelling the automatic renewal as soon as you sign up and subscribing again manually when you’re ready. To cancel the automatic renewal system, log into your account, go to the status page and click on the cancellation link. What Do You Get from Telegraph Dating For Free? If you are rading this, chances are you are considering joining Telegraph Dating…good going, its a big first step but I believe online dating is a great way to meet someone, especially with a predefined audience like the Telegraph. 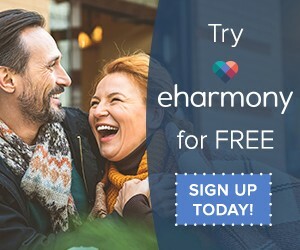 Now you have decided to bite the bullet and sign up for online dating with the Telegraph dating, the first thing you need to do is create your free account. You can type your details into the small form on the homepage old school-style or simply sign up with your Facebook account which already has all your info stored. Don’t worry – Telegraph Dating won’t post anything on your Facebook timeline, so your friends, or worse – your family, won’t know that you’re online dating. However you choose to sign up, you’ll receive an email with a link which you’ll need to click on in order to confirm your email address. After that, it’s onto the profile form which is pretty basic and should only take you 15-20 minutes to complete from start to end. The profile questionnaire covers contact and location info then carries onto your appearance, lifestyle and culture. If you don’t want to get that in-depth just yet, you can leave the drop-down menus with ‘Ask me later’ and come back to it when you’ve got the time – we always recommend filling out your profile as fully as possible. to make the most of your time on the site. The next page is pretty lengthy and is where you’ll input everything you’re looking for in your ideal match. The more info you include, the more spot-on your matches will be, so don’t skimp on this part. Telegraph Dating not only gives you the chance to state preferences when it comes to an ideal partner, but it also lets you say how important these characteristics are. For example, if you’d be 99% sure to avoid a smoker then you can choose this, but if it isn’t a total deal-breaker if they have the odd ‘ciggy’, you can specify this in the profile specifics. Then you get to the creative part. You need to create a profile headline, description of why people should get to know you and a full description of your ideal match. You can go back and change whatever you write later on, so it doesn’t have to be perfect first time. You’ve then got the option to add a photo. Telegraph dating claims that profiles with photos get ten times more views, so do it! If you haven’t got a good pic saved on your computer, you can pull one from Facebook. Then you can add extra info about yourself if you wish, such as personality traits, extra physical characteristics, hobbies, likes and dislikes, although this is totally optional and not needed to start searching for your perfect match. 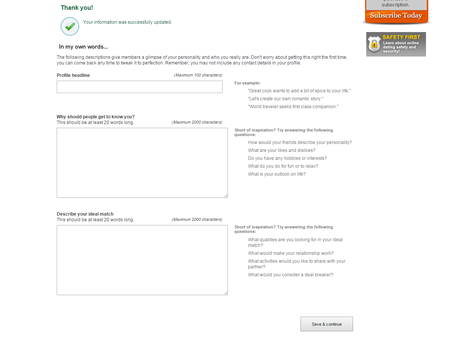 When you’re done, you can enjoy the site for free or click on the orange ‘Subscribe now’ button on the homepage to sign up for a paid account. Ifwe have a Telegraph Dating voucher code, make sure you click on the grey ‘Have a voucher code?’ link and type it into the box which appears in order to get the best price. Unfortunately a Telegraph dating Free Trial isn’t something I have been able to find, even after countless hours scouring the internet. Be sure to sign up to my email newsletter and any time a new discount or free trial pops up, I will send it to you straight away. Check below for the latest and greatest Telegraph Dating discounts and voucher codes that I have found for you lovely folk. If we dont have a code live right now you can either sign up to my newsletter and wait it out, or take advantage of my ‘free cashback’ offer below. There are some T&Cs that you will need to meet in order to qualify, but every little helps. 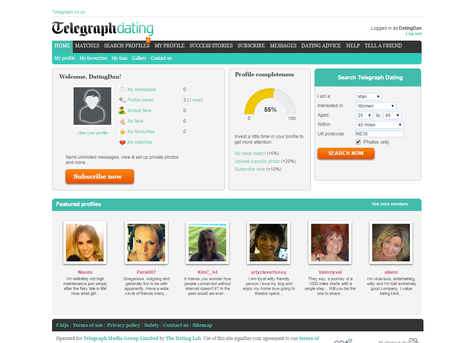 *EXCLUSIVE OFFER* Join Telegraph Dating through DatingPriceGuide.co.uk & receive £5 cash back. Sign up to the Telegraph Dating alerts and they will tempt you with some good offers to join. 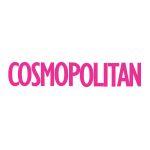 Stalk Telegraph Dating on Twitter & Facebook to nab some freebies. Convince a mate to join with you and you can claim freebies designed on how long they sign up for. Use this Telegraph Dating form to send an invite to your nearest ad dearest. If you already have a friend on Telegraph Dating, ask them to buy you a ‘friends’ 3 day membership for £7.50 – it will give you a tester before committing full hog!